Eagles generally prefer to shun civilization and distance themselves from humans, especially while raising a brood of eaglets. But last breeding season, a pair of bald eagles bent those rules, choosing a former osprey nesting platform near Warren County's western border, just south of Portland, PA, as the place to raise a family. It is possible the eagles chose this exposed site as a last minute replacement for a former nest that may have collapsed or whose tree may have been toppled by recent flooding. Located just a few hundred feet from the nearest road, the nest was easily seen by passersby, and became a popular local attraction last spring (2005). Building their nest along the bank of the Delaware River follows the bald eagle's preference for large bodies of water, which provide a fresh supply of fish and tall trees for superior vantage points. The male and female work together by bringing sticks, branches, cornstalks, and even rubbish to the site, then weaving them together into a nest. When complete, a new nest is about 5 feet wide and 2 feet deep. 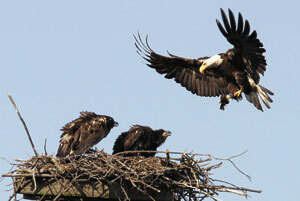 Eagles might use the same nest for years, making annual additions and increasing its size dramatically. Some nests may reach weights of several tons and eventually collapse under their own mass. 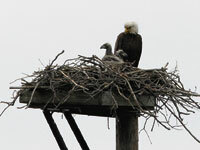 The eagle nest in Portland, however, actually diminished in size as sticks were displaced by the eagles' parenting activities. By the time the eaglets first flew in late June, the nest had been reduced to just a few sticks. To complete the nest construction, sometimes weeks before it is actually used for incubation, bald eagles might line it with moss, twigs, grass, or feathers. For some undetermined reason, possibly to freshen the nest or to provide some shade for the small eaglets, the male eagle often brings fresh evergreen sprigs to the site during the incubation period and the early days after the chicks hatch. During these periods, both parents stay within 1 or 2 miles of the site, protecting from predators such as squirrels, crows, gulls, and other eagles. 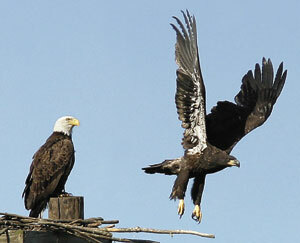 Bald eagles mate for life, usually seeking another partner only if the former one dies. Since eagles may live for 30 years, one pair can produce lost of little ones, although some claim that barely half survive their first year. Near the end of February, a few days after mating, the female will lay an egg in the nest, possibly followed a few days later with a second, and infrequently by a third egg. This begins the incubation period that is about 35 days long, during which one parent is always on the nest, not only to keep the eggs warm but to stand guard. Although the parents share egg-sitting duties, the female spends the most time on the eggs. The eggs hatch not at the same time, but in the order in which they were laid. The young eaglets take up to two days to work their way out of the shell and finally break free. Not much bigger than a clenched fist, the newborns are very wobbly and weigh only a few ounces. In one of nature's hard-to-understand designs, if two chicks survive the hatching ordeal, the older or larger chick may kill its sibling. Oddly, should this occur, neither parent will interfere. Although it is nearly impossible to discern the male from the female, eagle experts state that after the new eaglets hatch, the mother stays with them constantly, while the male provides the food. When the eaglets are older, the female shares in the hunting, providing equal shares of food for the ravenous, rapidly-growing eaglets. The Portland eagles followed this protocol, and onlookers were privileged to become familiar enough to notice the shift in patterns between the two adults as the chicks grew. Eagles are very efficient creatures, using minimal amounts of energy to accomplish life's chores. Although they are mainly fish eaters, eagles do not hesitate to take whatever prey is available or easiest to catch, including squirrels, rabbits, ducks, and similar prey. If opportunity presents itself, they might steal prey from nearby raptors such as ospreys and even other bald eagles. Or they may scavenge a meal by taking nearby carrion such as dead fish, mammals or birds. Newborns on the platform at Portland. Below: An Osprey buzzes the nest. A couple of weeks after hatching, the eaglets were finally able to hold their heads upright for feeding. Covered with a grayish down, they were only about a foot high, but their beaks and feet were nearly adult-size. Frequently one of the Portland eagles could be seen returning from the river or one of several nearby lakes with a fish gripped in its talons. The prey would be dropped alongside the eaglets and the parent would begin to tear it up into small pieces for the eaglets to eat. A week or two later, they were standing and tearing up their own food. Dark juvenile feathers began to grow when they were 5 or 6 weeks old, their bodies approaching adult-sized. Because of their rapid growth at this age, they had voracious appetites, keeping both parents busy feeding them. By the end of their second month, the eaglets would stretch their wings and were sometimes lifted a bit by the wind passing over the nest. As the Portland eaglets got older and more proficient at gliding in place over the nest, observers were often thrilled at the amazing display of stationary flight, mistakenly thinking that surely this must be the day this eaglet will fly. However, these displays went on for weeks before the thrilling young eaglets would finally take their first flight. Frequently throughout the course of the eagles' residence on the osprey platform, onlookers were also thrilled by the displays provided by nervy ospreys buzzing the nest. Maybe these daredevils were the former occupants of the platform, displaying their displeasure at having been displaced. For whatever reason, one or two ospreys would frequently fly high above the nest, causing the young eaglets to call to their parents for protection. At least one parent would respond immediately, flying up to challenge and drive off the ospreys. 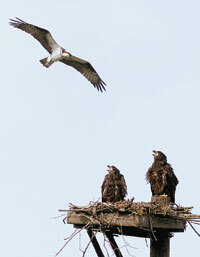 As the time for the eaglets' first flight approached, however, the parents became far less aggressive against the ospreys. Onlookers chuckled as they wondered if this was the parents' way of encouraging the young eagles to finally take flight. As summer approached, the wisdom of nesting on the exposed, shadeless platform­­really a 4 x 4 pallet stuck on top of a pole­­ was in doubt. In early June, the temperatures rose into the 90s for a few days, baking the dark-colored eaglets on their stage. Observers became concerned as the sun and heat took its toll, causing the birds to lay "spread-eagled" on the platform, panting noticeably, barely able to move.There was no way for the parents to bring water to the young eagles to prevent them from dehydrating. Their only source of water was the moisture in their food. Ultimately the eaglets did survive the intense threat of the heat, dehydration, and the constant threat of predators. Near the end of the third week in June, when they were about 3 months old and as Nature has patterned them, their first flights occurred just an hour or so apart. Both survived their initial flights but, sadly, some sources claim that nearly one out of three do not. In general, after taking their first flights, young eagles continue to take short flights near the nest, but the parents still provide all the food. They spend the remainder of the summer learning how to hunt by watching their parents and practicing their hunting skills. Young eagles leave the nest area when they are about 5 months old. After their first summer, they are on their own. They retain one of the various colorations of immature bald eagles, not becoming physically mature or attaining the white head and tail of the adult bald eagle until their fourth or fifth year. Despite the proximity of Portland's eagles to eager human observers and the exposure to the harsh late spring heat, they successfully raised their offspring. Did they survive beyond summer? I do not know the fate of the young eaglets. One question was heard over and over again last season, probably the same one you're asking. "Will they be here next year?" This February (2006) adult eagles could be seen perched atop the platform they used last year. Disappointingly, no new sticks had been added to the barren surface. But, just a few hundred feet away from the platform, in a tall evergreen in which they frequently perched last season, there is now a new large nest. And by the end of February one adult eagle could be seen squatting low in that nest while another adult circled above. Hopefully this means the eagles have adopted this site as their home, in a place much better sheltered, and certainly more natural-looking, than the stark wooden platform they used last year. The Portland eagles brought a lot of people together that probably would not have met otherwise. Ranging from people who knew nothing about birds to novice, expert, even some professional birders, there was a pleasant sense of camaraderie, companionship, and appreciation of nature as the roadside observers shared questions, answers, and hopes regarding the eagles. There was more to this site than just the eagles' nest. People came together and shared themselves with each other, something that seems to be harder to find these days. Maybe we'll see you there this spring! All photos included in this article were taken by Bob Koppenhaver at the Portland bald eagles' nest from April 2005 through February 2006. If you are interested in obtaining photos of local eagles, you email Bob for more details.